This photo was taken on Cape Cod, Brewster, Mass. It was a perfect, slow drive home from Provincetown. it's very calming. i envy your slow drive back home. (mine is a terrifiying trek through los angeles!) i will keep your buddha in mind next time! thank you. happy weekend to you too lo! it is very calming and I like what the butterfly does to the overall image. Love the photo and the blue butterfly~~I always use them to represent a soul rising. Yes, I think Buddha would most definitely approve! the butterfly is perfect, lo. it flies right in. 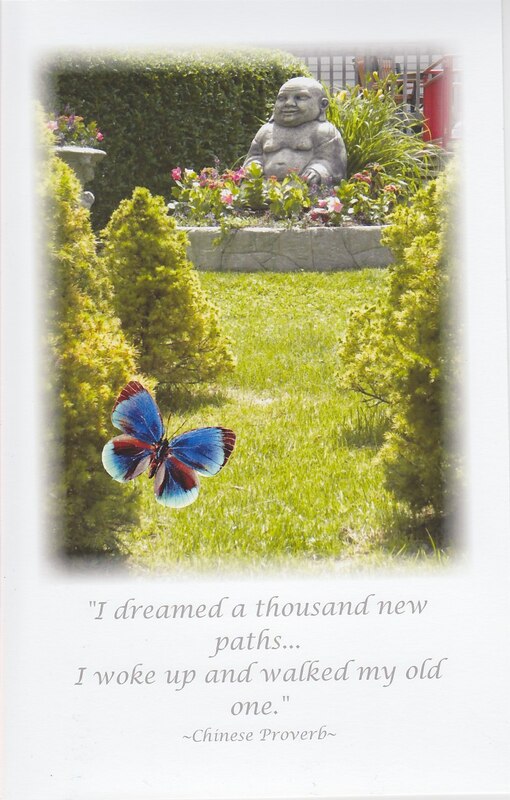 i like this card and this message: kind of like, there you are where ever you are! Butterflies are always a wonderful addition. Buddah looks quite content sitting in that flower bed. love the buddha. and also that same 6a drive. Now, when I come down from NH to the cape, I immediately switch from the highway to 6a, I love it so. the "old" Cape. Lovely, serene....soothing..I would want to drive that route and stop too! And the Blue Butterfly - PEREFCT!!!!! It is indeed a beautiful drive, thank you for this wonderful photo that you've shared! It's lovely! Wonderful card and quote dear!